Apple has been on a tear over the past year, in all the wrong ways. Apple’s stock is down an astonishing 30% since it hit a high of $133 per share back in February of 2015. The world’s largest publicly traded company was briefly dethroned by Alphabet (NASDAQ: GOOG) earlier this month before taking back the number one crown. What is going on with Apple’s stock, and more important, is it a prime time to be buying? Apple is the most profitable company in the world. It generated $233 billion in revenue in 2015 and was able to squeeze $53 billion in pure profit from that revenue, garnering a mouth-watering 22.9% net profit margin. Over the past 10 years, revenue has grown from $20 billion to $233 billion. Net income went from $2 billion to $53 billion. And free cash flow grew from around $2 billion to $70 billion. Per share growth was equally impressive with earnings per share growing from $0.32 per share to $9.22 per share and free cash flow per share growing from $0.21 to $11.83, representing a compound annual growth rate of 40% and 50%, respectively. Added to this, shares outstanding has fallen from around 6.1 billion shares to 5.8 billion shares, representing more earnings and ownership per share than a decade ago. On the back of these impressive financial metrics, Apple has also gotten more efficient, bringing its cost of goods sold and selling, general, and administrative expenses lower. These, combined with explosive growth in sales and profits, has propelled Apple to the largest and most valuable publicly traded company in the world. Growth over the past 10 years has been phenomenal, and Apple’s stock price reflected this by growing 14 fold over the past 10 years. Until this year. Even though Apple’s 2016 first quarter earnings showed yet another record quarter in terms of revenue, profit, and iPhones sold, Wall Street was not impressed. Apple’s stock has been pushed down to levels not seen since the summer of 2014. This makes little sense. Apple’s sales in 2015 are higher than in 2014. Apple’s profits in 2015 are higher than in 2014. Apple’s overall economic engine today is larger, stronger, and more valuable today than in 2014. The major reason why Apple’s stock is being valued at just under 10 times annual earnings is because the investing community and Wall Street are nervous about the iPhone. The iPhone makes up 66% of Apple’s revenue today. Where the iPhone goes, Apple goes. The fear is that Apple has reached a saturation point with the iPhone and growth will come to an end. Along with fears of stagnant iPhone sales, the other major reason stalling Apple’s stock price is fears of an economic slowdown in China. China has grown over the years to represent the second largest market for Apple’s products, and an economic slowdown in China would theoretically lead to lower sales of Apple’s products in the country. While these are legitimate concerns, I believe they are overblown, especially at these prices for Apple’s stock. Even if iPhone sales were to slow down, or even stagnate, Apple would still be producing over $50 billion in net profits per year. This is an astonishing amount of profits generated per year. Apple also sits on around $200 billion in pure cash. This represents around 40% of its total market capitalization. These impressive cash assets, combined with the fantastic economic engine of the company and the low earnings multiple all point to a margin of safety in the stock, where at these prices, buy and hold investors of Apple’s stock should see a satisfactory return over a 5 and 10 year period. However, the only burning question you need to answer for yourself before buying ownership in Apple is on the fate of the iPhone: where the iPhone goes, so does Apple’s fortunes in the foreseeable future. For a more in-depth analysis on Apple along with data and graphs, click here. 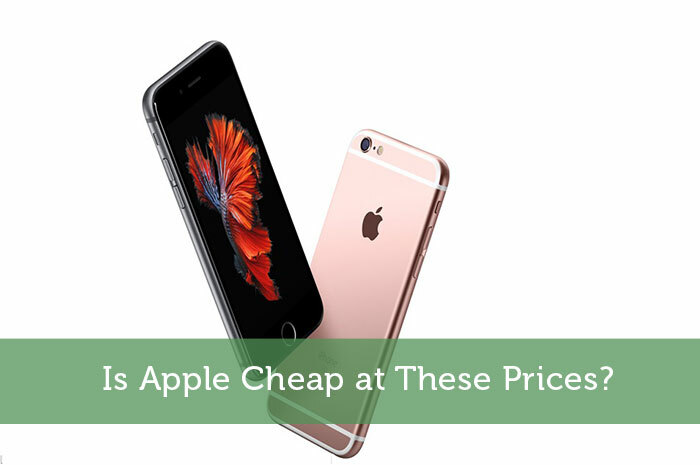 Is Apple (AAPL) Stock Cheap at These Prices?